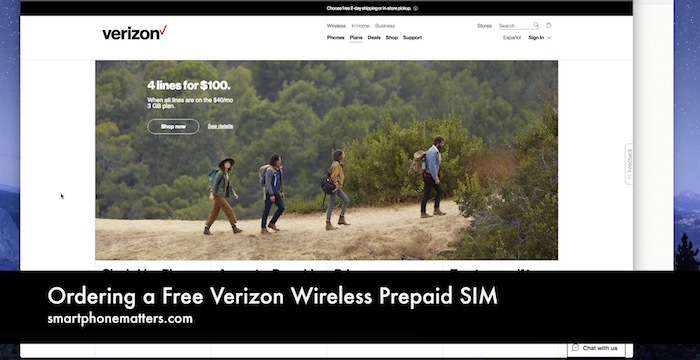 Several people have recently asked me how to you sign up online for Verizon Wireless prepaid and order a Bring Your Own Deivce (BYOD) SIM card. Signing up on line isn’t as easy as it and in my video below I show you how. If your phone is compatible, you’ll see Congratulations! Your device works on the Verizon Wireless network. Now if you look in the cart, you’ll see that they have added a free SIM to your cart. However you are not able to order the free SIM by itself. You’ll need to also choose which prepaid plan you want to sign up for and pay for your first month of service. Verizon has also automatically added the $40 Smartphone Plan to your cart. If you don’t want the $40 plan, click Edit and choose the plan you want.